So yesterday I finished and submitted my game for the Ludum Dare 26 jam. 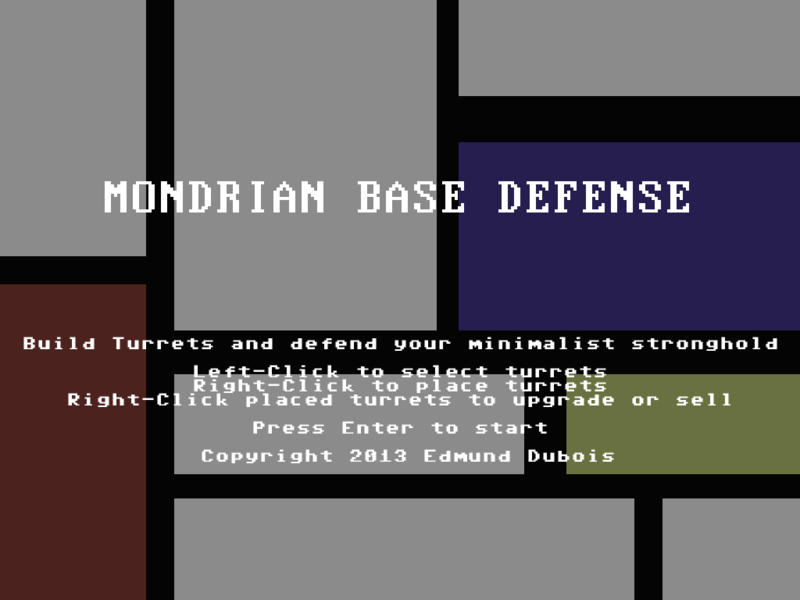 MBD, short for Mondrian Base Defense is a minimalist tower defense game. 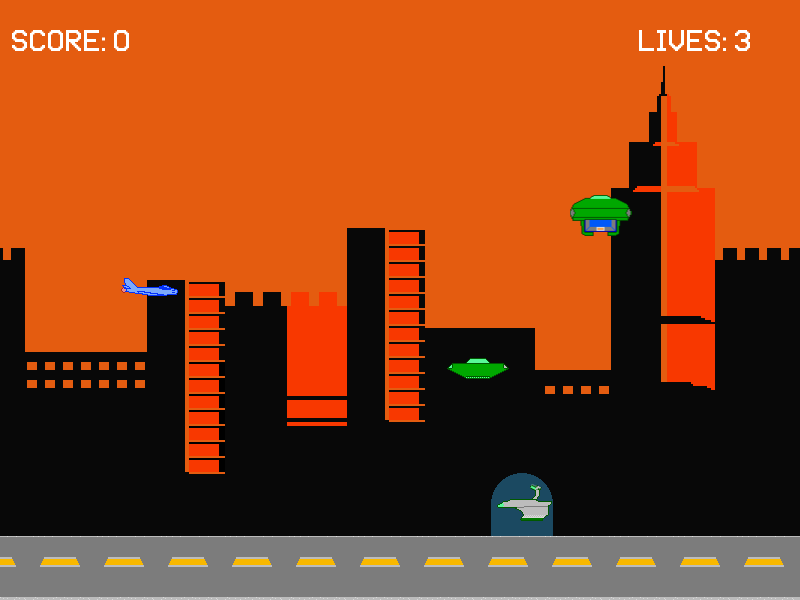 Very simplistic, in that you only have two tower types (Laser and Cannon) and three enemy types. Graphics are also pretty simple too as you’ll soon see below. 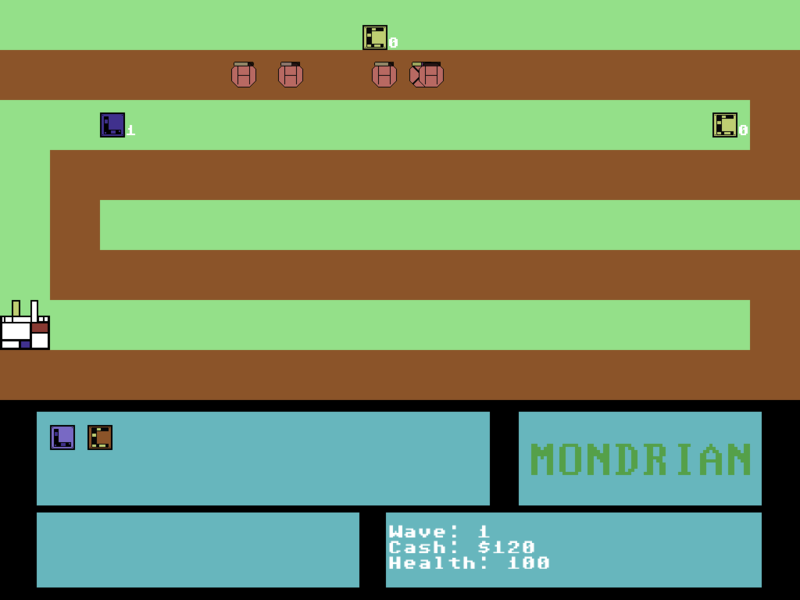 I went with the Commodore 64 color palette this time around because why the heck not. I had a lot of fun doing this, took me only about 48 hours (not nonstop mind you), and I learned quite a bit in the process. Like how to create individual health bars for multiple objects. Also how to use paths in Game Maker Studio. 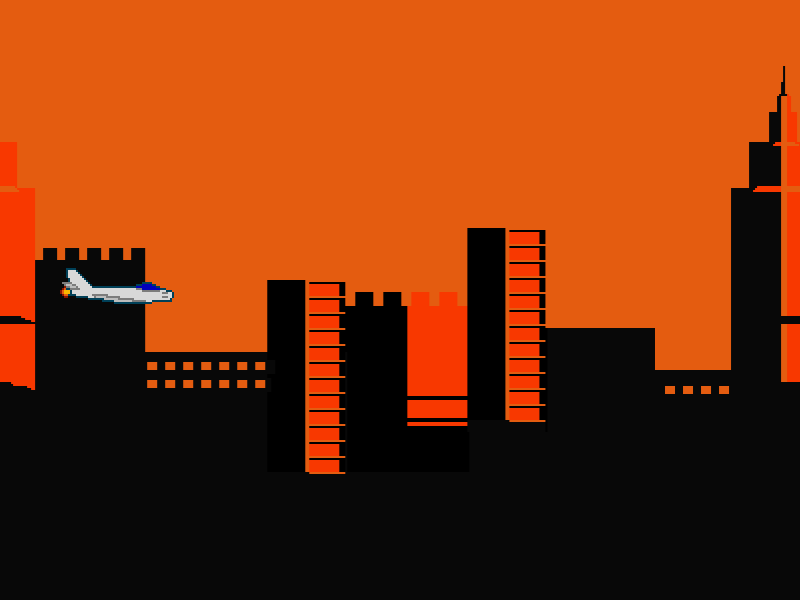 As for Invaders of the Stratosphere I do have a plan to revive the game as a Defender clone but I need to figure out how to accomplish the sort of screen-warping Defender does in Game Maker. So I’m really bad at staying on topic. Namely because I’ve put Invaders of the Stratosphere on hold when it’s probably like 90% feature-complete. 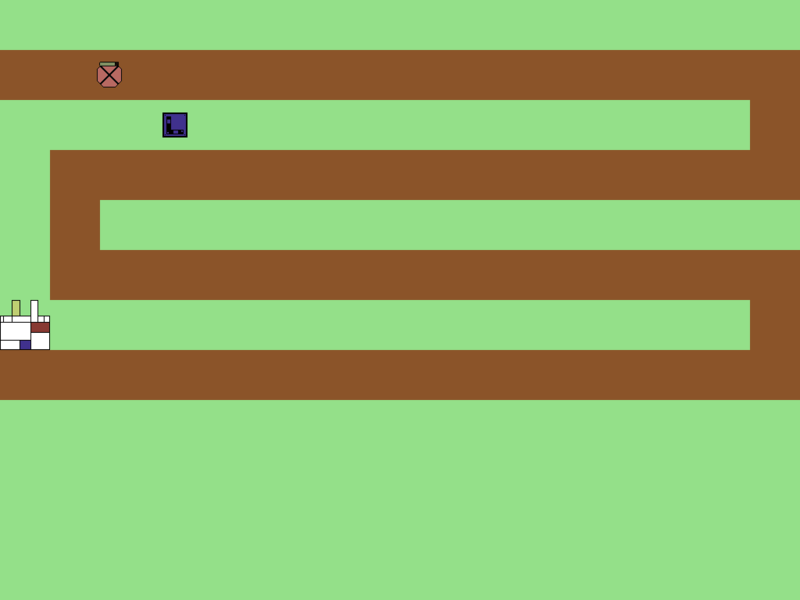 This was a decision brought on by Ludum Dare 26, of which I’m participating in the Jam portion of it. The theme was minimalism, I’d always wanted to try tower defense, and well, things snowballed from there. At least I got the shielded enemies working. 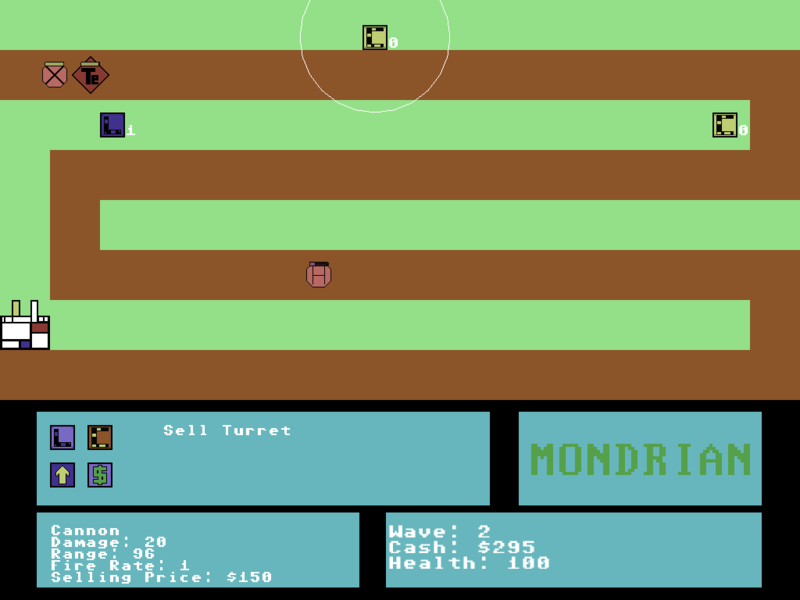 And now here’s a shot of MBD, “Minimalist Base Defense”. The large empty green space is reserved for the interface. Hopefully I’ll have more stuff up later in the week. So this month has been quite rough, game-dev wise. Initially I had plans of making a parody of Mega Man wherin you played a tax-collecting robot called Tax Man (yes you see what I did there) but it wasn’t really clicking. Apart from the “lol Libertarians” aspect I didn’t really have a lot going for the idea so I scrapped it; maybe I’ll go back to it next year. I initially thought about going back to Suburban Assault Riders but I wasn’t quite feeling like returning to it either, so instead I decided to just do a horizontal shooter, based on an idea I had back in 2007 or thereabouts. Incidentially this is what I’ve really liked about One Game a Month, in that it allows me to revist ideas that I had in college but didn’t have the time or know-how to work on. Invaders of the Stratosphere is a horizontal shooter based on 1950s b-movies about alien invasions (and also War of the Worlds). The player controls an F-86 Sabre fighter jet as they fight invading enemy forces across the planet. Most enemies will look like stereotypical UFOs but there will also be enemies resembling more famous alien vehicles such as the “manta ray”-shaped alien craft from the 1950s War of the Worlds movie. Right now I only have the following screenshot but expect to see more as I progress.